I got up close and personal with every new Cadillac. I got hands on time with most new Cadillac models on sale. Cadillac had an event ( that some of you on here might have known about) called Truth + Dare. It was held in the spacious parking lot of Angels Stadium in Anaheim. It was a great experience and I learned a couple of things as well. These are my impressions and take away’s. For starters: I have been really critical of Cadillac. I want them to succeed, but the sales and image aren’t there. Today changed my perspective for the better about the vehicles, though I still don’t think the sales will be there. The Cadillac’s on sale today for those of you who may not know, are competitive and on par with the worlds best. From the CTS-V’s monstrous performance, to both the CT6 and CT6 Hybrid being rolling tech beds for the line up, they have no problem competing. Its just getting people to pay attention to them. Anything lower and the cheapness shows. The lower ATS trims were nice as well inside. But that’s the downside: you shouldn’t have to pay the big bucks to get the quality. It defeats the purpose of them being a luxury brand. A lowly 34 grand 4 pot ATS should have the same interior quality as the rest of the cars. 4 Wheel Steering that actually works. Autonomous braking that they actually let us experience. It works. Damn well. I would gladly buy it over any M5/E AMG etc. I also applaud Cadillac for bring Brembo’s to the lower models. They stated that they were so impressed with the performance of them on the V models, they decided to make them options on the lower trims. So you can get a Brembo’s on the 4 and 6 cylinder ATS and CTS and they work fantastic. 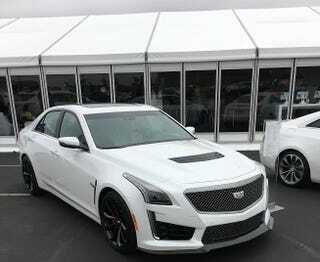 The CTS is ok auto crossing, but the ATS with its smaller chassis ( and terrible rear seat room) combined with the Brembo’s, will make a believer out of any 3 Series faithful. Now comes the tidbits that I got. The CTS-V pictured stickered as optioned as it was, with carbon fiber interior trim, carbon fiber rear spoiler and front lip, was just over $101 grand. When I saw that, I started to go around ask the most people I could what they thought about the cars and the prices on most of the cars. The gist of what I got was that while they were impressed with the cars and appreciated something American made being that quality and competitive, almost no one I talked to out of the many many people that were there thought they were worth the prices, and they wouldn’t pay for them new. One man a dedicated Caddy fan, said he makes it a point to watch for 2-3 year old models because they are a better value used than new. I felt that was sort of a big blow but I understood it. In the mist of everything though I got to talk to one of their product people: She said she couldn’t speak to everything when I told her about the rumors of whats coming, but 2 things that she did confirm was that: there is a crossover coming next year called the XT4, the 7 seater crossover was coming but it wont be called XT7 as everyone had thought, and that the larger than CT6 flagship would be here by 20', though a name for it hasn’t been decided yet and that that specific model is really being kept secret.